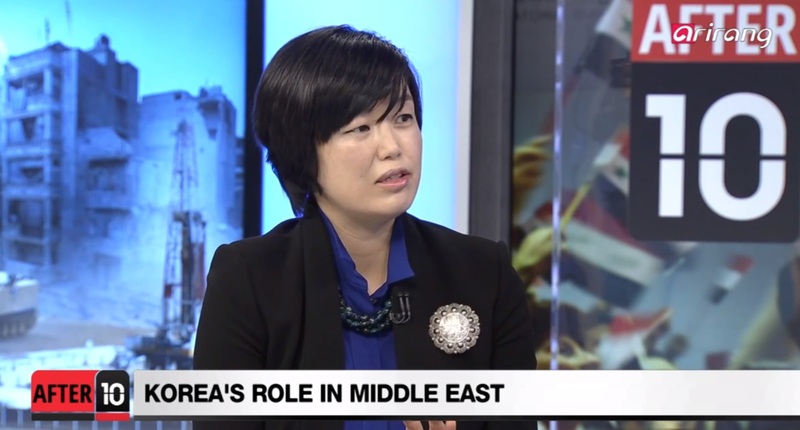 On Friday, January 3, 2014, Dr. Jang Ji-Hyang, Director of the Middle East and North Africa (MENA) Center at the Asan Institute for Policy Studies, was a guest speaker on Arirang TV’s After 10 to discuss the outlook for the Middle East in 2014. The wide-ranging interview covered the negotiations over Iran’s nuclear program, the ongoing Syrian civil war, political unrest in Egypt, and more. “After 10″ looks at the major issues on the Korean Peninsula with insight from prominent figures in politics and society. The program is named “After 10″ because it airs every weeknight, right after the 10 p.m. Prime Time News. “After 10” is a talk show that invites guests from all over the world who are engaged in matters related to the Korean peninsula. Produced by Arirang TV’s News Production Center, we discuss the hottest issues in politics, society, culture and the economy! Dr. JANG Ji-Hyang is a senior fellow and director of the Center for Middle East and North Africa at the Asan Institute for Policy Studies. Dr. Jang served as a policy advisor on Middle East issues to South Korea’s Ministry of Foreign Affairs (2012-2018). Previously, Dr. Jang taught comparative and Middle East politics at Seoul National University, Yonsei University, Ewha Woman’s University, and the Hankuk University of Foreign Studies. Her research interests include political economy of the Middle East and North Africa, political Islam, comparative democratization, terrorism, and state-building. Dr. Jang is the author of numerous books and articles, including The Arab Spring: Will It Lead to Democratic Transitions? (with Clement M. Henry (eds. ), Palgrave Macmillan 2013), “Disaggregated ISIS and the New Normal of Terrorism” (Asan Issue Brief 2016), “Islamic Fundamentalism” (International Encyclopedia of the Social Sciences 2008), and a Korean translation of Fawaz Gerges’ Journey of the Jihadist: Inside Muslim Militancy (Asan Institute 2011). Dr. Jang received a B.A. in Turkish studies and M.A. in political science from the Hankuk University of Foreign Studies and her Ph.D. in political science from the University of Texas at Austin.